Successfully Added Xiaomi Yuemi K01 Gaming Keyboard - TTC Red Switch, 6 LED Backlight Modes, Adjustable Angle, 87 Keys, Aluminum Body to your Shopping Cart. Meet the Xiaomi Yuemi K01 gaming keyboard, the ultimate LED keyboard that brings along a first class game experience while generating stunning LED light effects. For all gamers out there that are looking for the ultimate PC accessory to enhance their gaming experience, this windows keyboard certainly is a product to keep in mind. With its aluminum body, the keyboard has a mechanical touch – making it both durable and stylish. Compatible with Windows XP, Vista, 7, 8, and 10 – the Xiaomi Yuemi K01 is a gaming keyboard that works perfectly with the majority of computers out there. This 87 key gaming keyboard from Xiaomi comes with classic TTC red key switch technology, delivering low resistance and fast response rates. With its plug-and-play design, this LED keyboard can be connected effortlessly to your Windows computer via its USB 2.0 cable. Simply plug it in, let it connect, and you’ll be all set to enjoy all high-end features this amazing LED keyboard brings along. Featuring 6 different backlight brightness modes, this gaming keyboard is capable of portraying stunning visuals whilst in use – guaranteeing to leave an everlasting impression at all your friends and gaming buddies. Featuring an adjustable angle, the position of this LED keyboard can be customized to your personal liking – ensuring that your hands won’t get tired while gaming or writing up documents. Capable of withstanding 50 million of presses per key, this durable mechanical keyboard is guaranteed to bring along years’ worth of PC gaming fun and entertainment. 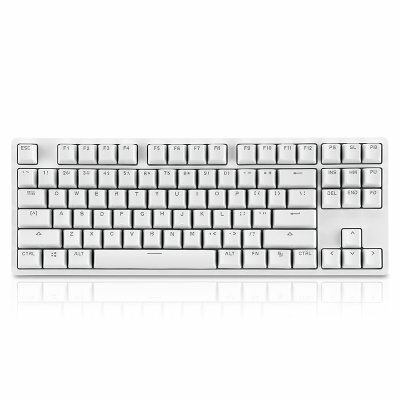 Whether you use it for playing games or simply to write up documents for work or school – this keyboard from Xiaomi is the perfect PC accessory that is here to meet all your demands. This LED gaming keyboard comes with a 12 months warranty, brought to you by the leader in electronic devices as well as wholesale electronic gadgets..